Product prices and availability are accurate as of 2019-04-13 02:06:01 EDT and are subject to change. Any price and availability information displayed on http://www.amazon.com/ at the time of purchase will apply to the purchase of this product. Looking for an installation DVD? All INTEL based Mac support USB boot (see instructions below) with no need to buy an install DVD. 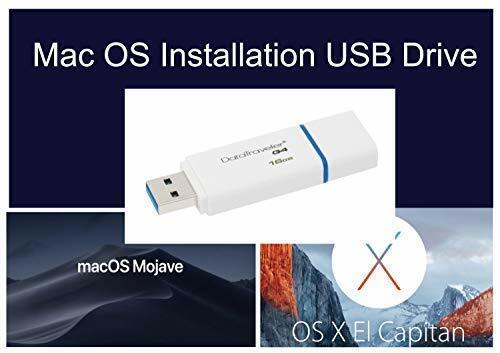 Mac OSX USB install/recovery drive. Use for new install on new HD/SSD or upgrade. To access startup/boot manager: 1) Press and hold the Option/Alt key immediately after turning on or restarting your Mac. 2) Release the Option/Alt key when you see the Startup Manager window. If your Mac is protected by a firmware password, you can release the key when you're asked to enter the password. 3) Select your startup disk, then click the arrow under its icon, or press Return. 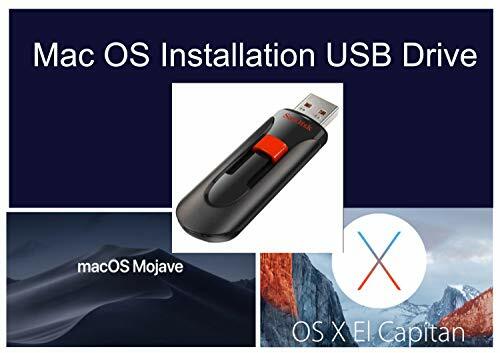 16GB Kingston G4 or 16GB SanDisk Cruzer/Cruzer Glide USB Mojave and El Capitan in 1 USB, Recovery or new install Includes security updates Buyer should have an Apple Mac computer to use with this USB so the buyer owns the license to install their own operating system onto their mac. Warning: If you see the error message "copy of install mac os cannot be verified corrupt". This means your Mac computer time is out of sync. It is NOT the problem of the USB drive. It's a simple fix. Please Google/Youtube for solution.